There's not been much happening in the climate denier blogosphere worth writing about with some exceptions, which I'll address in a future article. Anthony Watts is copying and pasting some stuff from WUWT deniers like Larry Hamlin and paid disinformers like Pat 'n Chip, wailing that "all the models are wrong". The same nonsense that Anthony wheels out when he runs out of ideas for new material. Delaying mitigation efforts beyond those in place today through 2030 is estimated to substantially increase the difficulty of the transition to low longer‐term emissions levels and narrow the range of options consistent with maintaining temperature change below 2°C relative to pre‐industrial levels. Why do so many people discuss the science or computer models…without first acknowledging they are all based on fraudulent temperature records that have been fudged. Do not trust the … “Captain” ! The “Watch Maker” turned “Ship Designer” on 2nd Deck standing by the spiral staircase and looking at the Ship-clock and glancing to his Swiss Chronograph on his wrist … knows ! 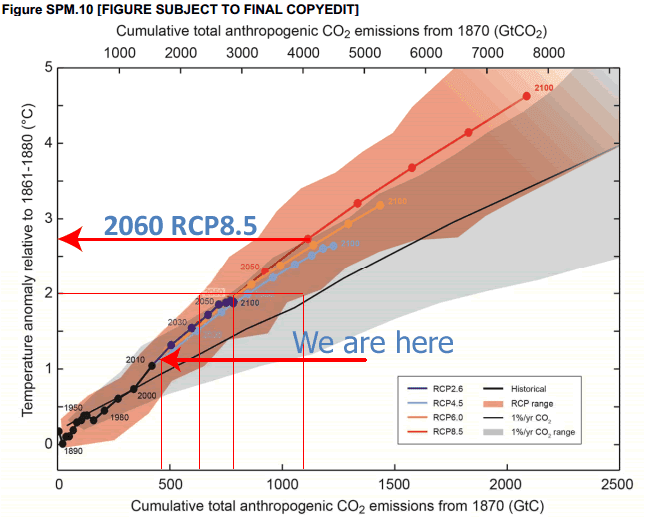 This analysis is devastating to the “CO2 is evil” CAGW believers. Ayatollah Al “Jezeera” Gore will issue a Fatwah against this blasphemy any day now. Results of 108-114 models were compared to actual temperatures. The models give a wider spread of results (0.4°C) for shorter time periods (Fig. 1 a and b) and a narrower spread for the longer time period. This seems to be intuitively wrong if the models had any capability to match reality. Models that don’t work so large numbers are used to create reality. How many wrongs do you have to use to make a right? The ensemble doesn’t do too well at matching reality. It’s total gibberish. How many billion dollars were poured down this rat hole? And they give advanced degrees and nice tenured professorships for this? Had been better had IPCC sent their so called experts on courses to learn by understanding Theories of Science what they forgot to learn during attending same courses once upon a time…. And let’s not forget our gratitude for the satellites which measure global temperature, for they have kept the statistics reasonably honest for the past 35 years. 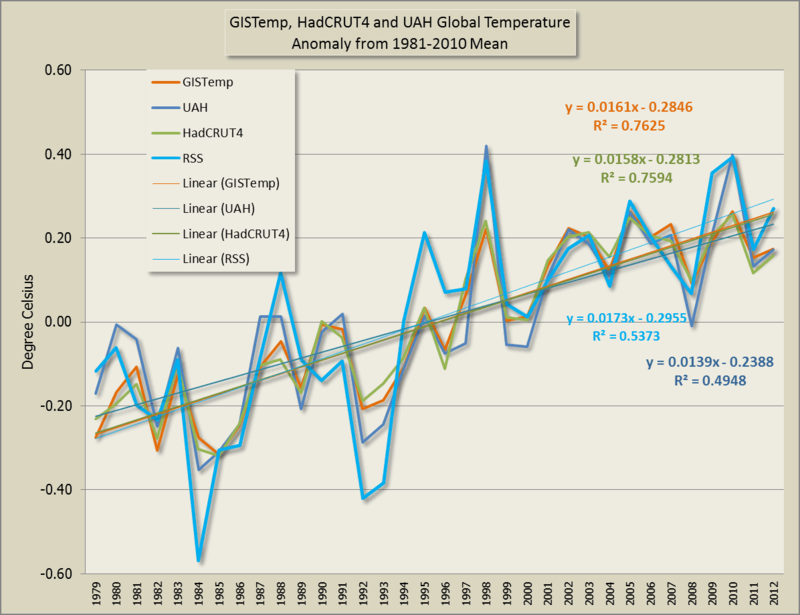 Prior to the late 1970s, the manipulation/torture/homogenisation of temperature data has run riot, especially the GISS numbers. Without the satellites acting as the police, the IPCC models would have undoubtedly been shown to be ‘correct’. I just read Larry Hamlin's illustrates perfectly how the denier mind works. There are some uncertainties and unknowables in climate projections therefore Larry tells you the IPCC must be fatally flawed and any policy suggestions can be thrown out. By analogy, the weather forecast for tomorrow suggests it will rain, 70% chance. But since there is significant uncertainty, I don't need the take an umbrella. Larry doesn't bother to prove or lay out his case. He just states it so it must be true. In his mind, anyway. Larry Hamlin is a retired Southern California Edison vice president of power production, and former state energy construction czar under Gov Gray Davis. So this makes him perfectly qualified to discuss climate science. (Only in the Bizarro world of climate deniers). I just don't get it, how deniers worship those who are the most unqualified to discuss climate science and have been so intimately involved in the fossil fuel business, yet dismiss the actual experts. What gives? Look, it's well known by the climate science community that for regional areas, climate models are quite poor, but for global averages over long periods of time, they perform spectacularly well. These short comings are well known, and are accounted for. Climate models will, and always will, remain just another tool in the varied toolkit of the climate researcher. They still require expert assessment. But to the average denier, they are of the mindset that climate models are wrong, so everything else about climate science is also wrong. But this is clearly not the case. But trying to convince a climate denier the facts is pure folly. For a really good assessment of climate models, check this out.